Where possible re-use and recycle packaging, furniture, clothes, and anything else you can think of, for example by using charity shops to buy clothes, and donating your own old ones. Kerbside collection: There is a weekly recycling collection service for nearly all homes across the Mendip District,for paper, glass, cans, textiles, shoes, foil and yellow pages. Different types of material should be separated, for example using old plastic bags. To get a new box call customer services at Mendip District Council, where you can also find out which day your recycling is collected. You should also be provided with a box for recycling food waste. 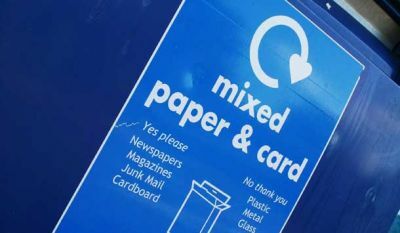 Mini-recycling banks: If you want to get rid of your plastic bottles and cardboard, there are a number of sites across the District, which also take a range of other materials. Find your nearest sites by calling Mendip District Council customer services or looking on the Recycle Somerset website. With plastic, you can only recycle bottles, which must have the numbers 1, 2 or 3 in the recycle symbol on the bottom. Recycle Somerset gives full information about which types of waste your nearest centre takes.The site, which has been produced by the Somerset Waste partnership, includes tips on a great many materials, and information on where and how the different materials and products are recycled. The Freecycle network is an international movement focused on minimising the amount of stuff going into landfill. Just take a look at the local dump/recycling centre sometime and see how many things are just in need of a clean or minor repairs (that old sofa which needs re-covering for example). The freecycle groups act as local hubs for people to post either offers of items they no longer need or those they want. There are two local freecycling groups in Mendip:Shepton/Wells/Street freecycling group and Frome freecycling group. Computer Aid accepts donations of old computers for re-use in schools and community organisations in the developing world.